FTI-Eb is a high-accuracy, fixed thermal imaging camera, optimised for use in refractory-lined furnaces or boilers, and supported by an extensive range of dedicated accessories for resilient process performance. The wide-angle-view borescope allows AMETEK Land’s proven thermal imaging technology to thermally image large areas of a furnace interior with precision, requiring only a small diameter furnace wall penetration. This minimises wasted energy and disruption to the process. 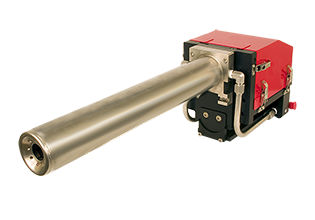 Located outside the furnace or boiler with the borescope optics inserted through the wall, the high-resolution FTI-Eb Borescope provides detailed thermal information via a 100Mbps Ethernet connection. This supports optimum process control from more than 110,000 radiometric temperature points within the image. With a choice of either 30 or 60-degree Horizontal fields-of-view available for precise process customisation, FTI-Eb is ideally suited to many industry applications that use dirty fuels like oil or dirty gases, including reheat furnaces, boilers and incinerators. The specialised 3.9um wavelength allows the imager to see through the hot CO2 and H2O products of combustion. Large openings in the refractory wall cause heat loss. It can also be difficult to keep the opening free of debris. FTI-Eb needs only a small opening, giving a viewing angle of 30° or 60° for maximum product coverage. An integral part of AMETEK Land’s intelligent imaging solution, FTI-Eb is complemented by a range of dedicated accessories including image processing software, control processors, and protective industrial housing to ensure reliable operation in hostile conditions. A high-performance water cooling system, with low flow requirements, allows operation in high furnace temperatures, while the integrated air purge keeps the optical system clear of debris. FTI-Eb is an integral part of AMETEK Land’s intelligent imaging solution, and is designed for furnace and boiler applications.